Rosalie Lubomirska, nee Chodkiewizc, was a Polish princess guillotined during the Terror. 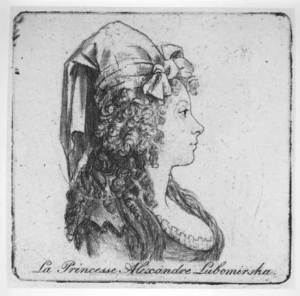 Born on 16 December 1768 at Chernobyl, then in Poland, Rosalie, who was described as "beautiful as a painting of Venus", married Prince Alexander Lubormirski at an early age. The young princess loved music, literature and travelling. She visited London, Vienna and Nice and was in Paris when the French Revolution broke out. Like many aristocrats, Rosalie warmly welcomed these new events that were supposed to bring happiness and liberty. Revolutionary fever spread throughout Europe. The "Polish Patriots" were trying to bring about a revolution in their country as well and, in 1791, Rosalie decided to return to Warsaw to support them. But their efforts failed. Russia and Prussia ruthless squashed the revolt, deporting many revolutionaries to Siberia. Others, including Rosalie, managed to escape. She went first to Vienna, then to Lausanne and, in early 1793, she made the unfortunate choice of going back to Paris, where she resided, with her daughter Alexandrine, her lover, the Prince of Salm-Kyrburg, and his sister, Princess Amelia of Hohenzollern, at the beautiful Hôtel de Salm. Although she had initially supported the revolution, Rosalie embraced the royalist cause after the execution of Louis XVI. 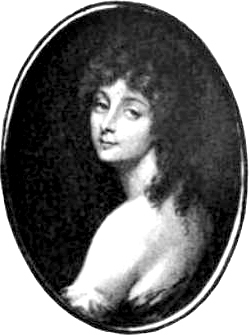 After a row with her lover, Rosalie moved with her daughter in a house of her own, where she entertained Polish and English guests, some of whom were spies of the English government, and the Prince de Talmont, a leader of the counter revolutionary Vendéan army (his younger brother, the Abbé de la Trémoille, would become her lover). This obviously attracted the attention of the Committee of Public Safety and, on 9 November 1793, Rosalie was arrested. She was first taken to the Petit Force and, in January, was moved to the maison de santé La Chapelle, a much more comfortable prison. Accused of corresponding with Madame Du Barry and of being an emigree, on 30 Germinal she was condemned to death by the Revolutionary Tribunal. Terrified, Rosalie, to prolong her life, falsely claimed to be pregnant. Pregnant women were then held at the Maison de l’Évêché until they had given birth. It seems that Rosalie and her lover Tremoille were caught together in the prison bathroom, where they were trying to conceive a baby. He was arrested and guillotined a few days later. Her last hope gone, the revolutionaries soon realised that Rosalie wasn't pregnant after all and, on 12 Messidor, they transferred her the Conciergerie, the antechamber to the guillotine. She was executed that same day. Her remains were thrown into a common grave at Picpus.